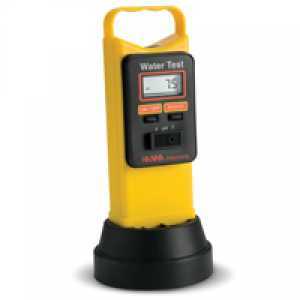 อุปกรณ์วัด Multiparameter (Water Test Portable pH/ORP/EC/°C Field Meter) | All Test Kit by Higher Enterprises Co.,Ltd. Water Test provides quick and reliable measurement of the four most important variables of water analysis: pH, ORP, conductivity and temperature. The lightweight and compact body makes it perfect to use in the plant as well as in the field. Superior in design and construction, Water Test is made of rugged VALOX® material which offers excellent protection from typical environmental conditions. Water Test is designed with such simplicity that even non-technical users can operate it: fill the base of Water Test with the sample to be measured, press “RANGE” to select the mode and then simply read your measurement! The rugged construction and simple operation make Water Test ideal for water treatment analysis, wastewater tests, ecological studies, aquaculture and hydroponic applications.